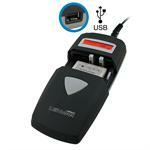 RLI-004-.6 : 3.7 volt 600mAh Li-ION battery for LogitechMX Revolution wireless mouse (older version). Replaces original battery #s 533-000018, F12440097, L-LY11. Re-charges with original stock charging system, or with our BCUNI3 multi-charger.